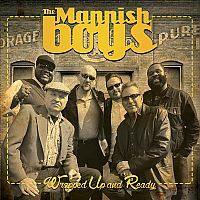 The blues supergroup known as The Mannish Boys has done some pretty terrific stuff over the years, so to say that their newest CD Wrapped Up and Ready (Delta Groove Music) may just be their best yet is no small accomplishment for this California-based contingent. Having first stepped in to assist with vocals on the band’s last release Double Dynamite, Sugaray Rayford assumes the lion’s share of the vocals on this one, with veteran vocalist Finis Tasby confined to a long-term care facility following a 2012 stroke (here‘s how you can help). While Tasby’s voice is of course missed and would only help to make this already superb recording that much stronger, the ailing singer can rest (and, hopefully, recuperate) easy knowing that his role in the band is being handled so capably. Keeping with a rich Mannish Boys tradition, Rayford has plenty of help, trading off on vocals with other members of the band (guitarist Franck Goldwasser on “Struggle in My Hometown” and “Don’t Say You’re Sorry”, and harmonica player and producer Randy Chortkoff on “Can’t Make a Livin'”) as well as guests such as Candye Kane (Ike Turner’s “I Idolize You”) and Steve Freund (“The Blues Has Made Me Whole”), in addition to being supported by guest musicians that include guitarists Kid Ramos and Monster Mike Welch, harmonica aces Kim Wilson and Bob Corritore, pianist Fred Kaplan, and horn man Ron Dziubla, among others. Combine that with the already considerable talent of the core band – which also includes Kirk Fletcher on guitar, Willie Campbell on bass, and Jimi Bott on drums and percussion – and the end result is an immensely entertaining and diverse collection of songs, from the Chicago swagger of the opening “I Ain’t Sayin'” penned by and featuring Mike Welch as well as some strong vocals from Rayford in delivering such lyrics as “I ain’t sayin’, I’m just sayin’, you can use a man like me”, all the way through to the album’s tight 8-minute closing instrumental, “Blues for Michael Bloomfield”, with a whole lot more good stuff in between. Like, for example, the swinging, T-Bone Walker-styled “Everything’s Alright” (Roy Brown), with Ramos on guitar and Dziubla on sax in addition to being one of two tracks to feature Campbell on upright bass (and you can really dance to it). From there, the band moves to a groovy “Struggle in My Hometown” that showcases Goldwasser on both vocals and lead guitar along with some rather neat, jazzy transitions before they arrive at the upbeat title track featuring Wilson on harmonica and background vocals as Kaplan tickles the ivories. Truth is, this album is just one great song after another, moving, for example, from the slow blues of “It Was Fun” with Freund on lead guitar and some more great piano from Kaplan, to the early rock & roll territory of a Chortkoff-penned “I Can Always Dream”, and then on to Kane on vocals for the creeping “I Idolize You”, where she’s accompanied by her own guitarist Laura Chavez, Chortkoff on harp, and some nice female background vocals. Wilson returns on harmonica, Welch on guitar, and Dziubla on saxophone for the soulful “Something for Nothing”, while Chortkoff contributes both harp and some gritty vocals on the country shuffler “Can’t Make a Livin'”, joined by Welch on tremolo guitar and newcomer Trenda Fox on vocals. A Welch-penned “I Have Love” features Corritore on harmonica and Welch on lead guitar, with Ramos making his second appearance on guitar on the swaying “She Belongs to Me” (Magic Sam) before Goldwasser’s spitting, Duke Robillard-like vocals and slide guitar help close out the collection with “Don’t Say You’re Sorry”, followed only by the aforementioned “Blues for Michael Bloomfield”. Even having said all that, we still can’t say enough good things about this album – from Rayford’s intense vocals on songs like “You Better Watch Yourself” to the tightness of the band throughout – but we hope by now you’re starting to get the picture: this is one you really need to hear to appreciate. It may not come all tied in a bow, but this latest project from The Mannish Boys is wrapped up and ready for critics and fans alike. Easily one of the strongest releases of the year, don’t be surprised to see it nominated for a few awards down the road. This entry was posted in Albums and tagged Bob Corritore, Candye Kane, Finis Tasby, Franck Goldwasser, Fred Kaplan, Jimi Bott, Kid Ramos, Kim Wilson, Kirk Fletcher, Laura Chavez, Monster Mike Welch, Randy Chortkoff, Ron Dziubla, Steve Freund, Sugaray Rayford, The Mannish Boys, Trenda Fox, Willie Campbell. Bookmark the permalink.